As part of BBAW, today we're all invited to highlight some of our favourite book blogs that weren't included in the shortlists for the BBAW Awards. I have far too many favourites (don't worry, though, I won't let my cats and dogs starve), so I came up with this list through the highly scientific process of opening my favourites folder and going "eeny, meeny, miny, moe". Page 247 - Gavin is one of the bloggers whose taste is the most similar to mine, so I know I can always trust her recommendations. Bookgirl's Nightstand - Iliana is a veteran among book bloggers. She's smart, friendly, and a very talented writer and crafter. Kiss a Cloud - Like Iliana, Claire has many talents. I'm in awe of her skills as a photographer - she always makes everything look so perfect. Not to mention, of course, the fact that she recommends fantastic books. Books & Other Thoughts - Darla's taste is very eclectic. She reads classics, YA, children's books, fantasy, manga, Gothic novels, you name it. I've lost count of the number of books I've heard of for the first time at her blog. Fyrefly's Book Blog - As Nicki was saying the other day, even computers think we have similar taste in books. If I ever happen to run out of fantasy recommendations, I know the crisis will be immediately solved if I stop by her blog. Paperback Reader - Claire is so smart that she'd be intimidating if she wasn't also extremely friendly and approachable. When I go to her blog I'm guaranteed to find something a little different. And I love her coloured bookshelves posts. Stella Matutina - The thing about Memory's blog is, I'd still be reading it even if I didn't care one bit about the books she reads. If tomorrow she decided to start blogging about fishing instead of books, I'd keep reading. Because yes, her writing is that engaging and entertaining. Thank you for doing what you do, guys. What about you? What are some of your favourite blogs? Thank you so much, Nymeth! I am touched and the feeling is mutual. I plan to write my post later this afternoon. My google reader has just been added to exponentially, all but Claire (the other Claire, obviously) and, recently, Memory, were unknown to me. 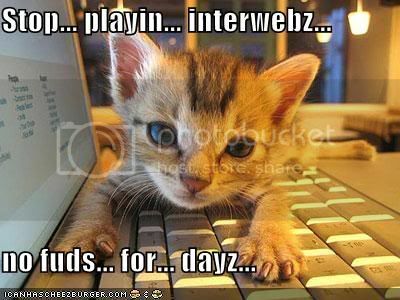 As always, I love the lolcat :). Great list! All of them are known to me and some narrowly missed being on my list. I think we have similar blogging tastes! Thank you so much! I can't wait to check out the others I'm unfamiliar with. Oh wow a couple I seem to have missed. thanks so much! Melody and Beth, you're most welcome! Claire, I look forward to hearing about your favourites. Jackie, I think we do too! Oh goodness - thankfully I already follow some of these folks! Like I said to Rebecca at Rebecca Reads, I think I'm gaining more new blogs from this than the original shortlists! I look forward to checking our all these fabulous blogs. It's such an honor to be included among some of my favorite blogs ON one of my favorite blogs! I've got to find some time today to write up my post still. I'm definitely going to have to check these blogs out. Thanks for highlighting them! Some great blogs here for me to add to my reader! I may have to grow an extra me to get through my Google Reader when BBAW is over. Great list of blogs! I like when people do this! I already do read 4 of them but I will now check out the others. Thanks Ana! My reader is going to implode soon! I know some of these bloggers, and some I don't. I'm off to explore! I think I will have to randomly choose, too, if I get time to do my post later! Most of those blogs you listed are new to me- and they look fantastic. Thanks for introducing me to some great new blogs. Oh, fun! Some new ones to check out!! Although, admittedly, I'm with Debi. I cannot keep up with my reader. You know you just put a smile on my heart that shall last forever, don't you? And you know, the feeling's mutual! And even if we both quit blogging today, you would never stop being one of my very best friends in the whole wide world! But thank goodness for highly scientific methods, huh? Without them, I fear everyone's posts would go on for pages and pages and pages. I know mine would have, and I don't even know that many people. I think my reader is going to explode! Most of your picks are new to me so you've given me lots to explore. I'm going to be adding some more blogs to my feedreader, I think - I'm with Kathy, my reader's going to explode! But it will be well worth it. Thanks for introducing me to some great bloggers. I'm going to bookmark this page so I can visit each. I'm afraid how much bigger my blogrolls are going to become. While you were shortlisted, there are categories I think you should have been included in. See my BBAW post. I can't believe there are still blogs that are new-to-me! I love it. Thanks so much for the list, Nymeth! Nymeth - Thank you so much! It's wonderful, this community of readers. I listed Claire and Fyrefly as well, but you've got a couple I don't recognize that I will visit right away. Claire does take such gorgeous pictures, I agree! Even if the book is something I would have no interest in, the way she photos it makes me immediately want to pick it up. Great list, Nymeth. Ooh! Some of these are my favorites as well! Now off to check out the unfamiliar. Thanks! My head is spinning from all this blog love. I'm discovering so many new blogs (thank you!) and it's always great to see some of my favorites highlighted as well. You've got a great list here. It's impossible to fit them all in, isn't it? So many great blogs. Uh oh! I found a new blog to add to my reader! How did I not know about Paperback Reader?? I lover her blog! I just spent quite awhile scrolling through it :) Everyone else I follow already and love. I'm totally digging all of this blog love by the way! And that is the cutest damn LOL Cat! How did I not know about so many of these?? Yikes, my reader is ALREADY exploding! I'm loving these little snippet intros to other book blogs! Makes it so much easier to decide whether it would be a good fit for me than having to read every book blog out there. :) I've seen a couple of your recs before but not the rest. I'm off to check out the others! Quite a few new to me blogs too so I must go visit them! I'll have to check out all of those blogs! I'm alwyas in need of someone new to add to my blogroll.